How to Manage Search Option in Joomla Website? No matter what kind of website you are making or need to develop it is necessary to have a search option. For example your website may be a content management system, or a simply blog or even an ecommerce website. All the mentioned types of websites require search options. For example if you have an informational website and have developed it using Joomla for a content management system. Informational websites can get quite big too and in order to make it easier for the user to get to what they are looking for directly you will require a search option. The very important search feature can be set from the administrative section of your website. In general no website should be without a search option. You can set it by simply logging into the admin section of your website and navigating to the modules section by selecting Extensions >> Modules from the admin menu. Here you will find the search module; if you don’t see it you may have to either search for it or create a new module of the search type. Once you do create a search module or edit an existing one; you will notice several layout options pertaining to the search button, etc. Select the appropriate setting for each option and save it. Make sure the search module is in the published state before closing it. There is one more thing that you need to set though and that is the position for the search module. Set the position from the drop-down and save and close your module. 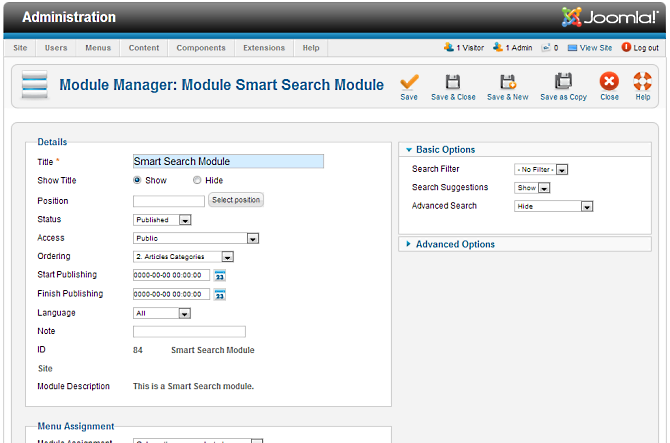 Now refresh the user side and you will find the search module is the place of your choice. (as per your selection). This is one of the simpler features of Joomla that does not require a great deal of programming skill. Joomla in general is quite simple and easy and doesn’t require a degree in rocket science to operate. The user interface is quite intuitive and the options provides cover most of the basic necessities. However setting up a Joomla website is not all straight forward and it is quite easy to hire a professional Joomla web developer to do the job. Don’t get me wrong; it is easy to do the basic installation and configuration of a new Joomla website. But if you do require some level of customization which now just about all of us do then it is necessary to get in touch the professionals. Alakmalak is one such professional Joomla web development company capable of handling your issues big or small. How to manage search option in Joomla?